Shipping papers describe the hazardous materials being transported. Shipping orders, bills of lading and manifests are all considered shipping papers. Carriers and drivers to put tabs on hazardous materials shipping papers, or keep them on top of other shipping papers and keep the required emergency response information with the shipping papers. 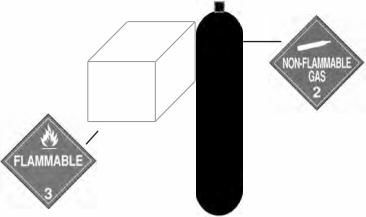 Shippers put diamond-shaped hazard warning labels on most hazardous materials packages (see Figure 9-2 below). These labels inform others of the hazard. If the diamond label will not fit on the package, shippers may put the label on a tag securely attached to the package. For example, compressed gas cylinders that will not hold a label will have tags or decals. Placards are used to warn others of hazardous materials. Placards are signs put on the outside of a vehicle that identify the hazard class of the cargo. A placarded vehicle must have at least four identical placards. They are put on the front, rear and both sides of the vehicle (see Figure 9-3 below). Placards must be readable from all four directions. They are 10 3/4-inches square, square-on-point, in a diamond shape. Cargo tanks and other bulk packaging display the ID number of their contents on placards, or orange panels or white square-on-point displays that are the same size as placards, and placed near the placards. Make sure you understand what is considered to be a shipping paper. There will be many rules and regulations about shipping papers throughout this section. Remember: Shipping papers may be the only way for emergency responders to determine the type of hazardous cargo you're hauling. That's why there are very specific rules in place, as seen below. The entire list below is very important. Many questions on the written exam are pulled right from the below list. Be very familiar with it! Questions are frequently pulled from this entire list, but this is the most important part to remember. You should absolutely memorize the below information on where drivers are required to keep shipping papers. It is very likely you will receive a question on the written exam about where to properly store shipping papers. Placards and/or warning labels should be diamond-shaped. The purpose of labels and placards is to inform others of the hazard. If a diamond label will not fit on a package, shippers may use a tag securely attached to the package. Placards are used to warn others of hazardous materials. A placarded vehicle must have at least four identical placards which are placed on the front, rear, and both sides and viewable from all four directions (the front placard may be on the front of the truck or trailer). Placards are used to warn others of hazardous materials. Placards are signs put on the outside of a vehicle that identify the hazard class of the cargo. A placarded vehicle must have at least four identical placards. They are put on the front, rear and both sides of the vehicle. Placards must be readable from all four directions. They are 10 3/4-inches square, square-on-point, in a diamond shape. Cargo tanks and other bulk packaging display the ID number of their contents on placards, or orange panels or white square-on-point displays that are the same size as placards, and placed near the placards. Always be sure to ask for an extra placard or two when leaving a shipper in case a placard is blown off the truck during transit. 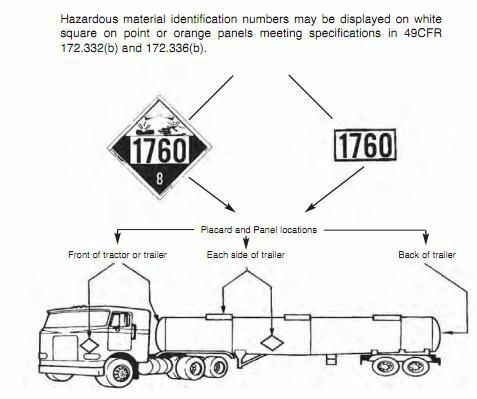 A truck carrying 17,000 pounds of a single hazardous material must display how many placards? It's good practice to grab an extra placard or two from the shipper in case one of your placards is blown off the truck during transport. Shippers put diamond-shaped hazard warning labels on most hazardous materials packages. These labels inform others of the hazard. If the diamond label will not fit on the package, shippers may put the label on a tag securely attached to the package. For example, compressed gas cylinders that will not hold a label will have tags or decals. What is the proper shape for a placard?